In addition to Star Realms: Frontiers additional command decks were introduced named The Alignment, The Alliance, The Coalition, The Pact, The Union, and The Unity. Features of each of these 18 card packs: Allows you to play as a Legendary Commander in the Star Realms universe. 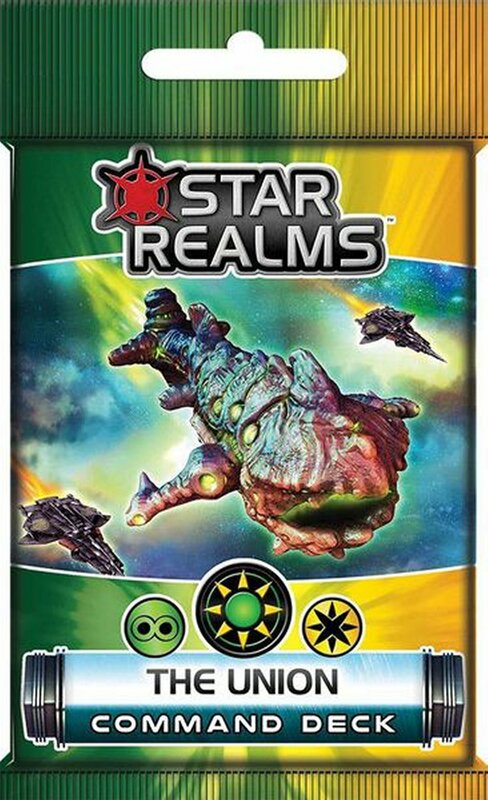 For use with Frontiers or any other Star Realms set. A Legendary Commander card which shows your Commander's hand size and starting Authority. 2 new, easy to use score cards. 2 Gambit cards, unique to your Commander. A mighty 8-cost mega-ship. Your Commander’s custom 12-card starting deck, that includes new cards from your Commander’s two favored factions. With this powerful deck you will be able to battle against other commanders, or play as raid boss taking on multiple opponents playing standard decks.